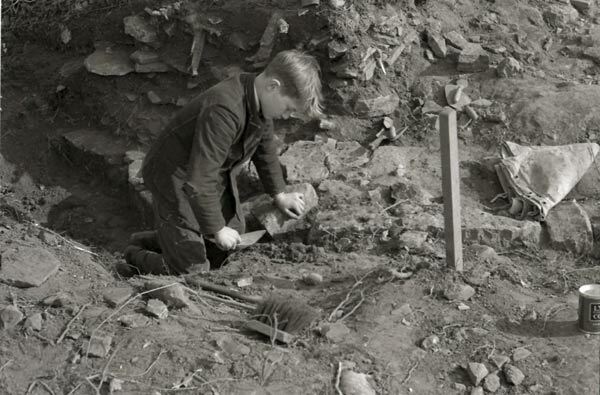 What would happen if you found bones while digging in the garden? Would you know what to do? What is legal and what is safest? Today’s guest post comes from a biological anthropologist with some basic, helpful advice for making the right decisions should your shovel uncover some unexpected bones. Want to see some amazing ones? 7 Incredible Backyard Bone Finds. 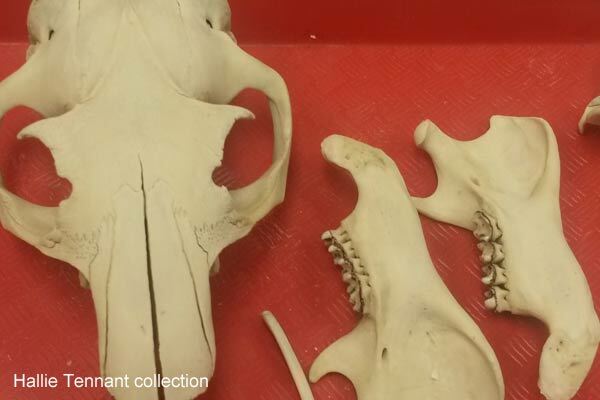 If you have common animal bones you want to save, see How to Clean Animal Bones for Display. The article is for general information only. Always obey the law and contact authorities in your area to report and identify any unidentified or suspicious finds. Human remains must never be touched and do not ever handle animal remains without first checking local laws and following proper precautions. It’s a beautiful Saturday morning: birds are chirping, the sun is shining, and all is well. You step out into your backyard, shovel in hand, hoping to get an early start on those new garden beds you’d been planning to add for months now. Just as you settle into digging, the blade of your shovel hits something firmer than the surrounding soil with a resounding THUNK. Intrigued, you clear away the overlying dirt to see what it is, only to reveal what is clearly part of a skeleton. Your mind immediately leaps to all of those CSI reruns you watched last winter (could it be a crime scene?!) before calmly descending to reality again. “It’s probably an animal,” you tell yourself somewhat hopefully, using your gloved hands to brush the soil away from the bone. But what is it? For virtually anyone who has worked outdoors, this probably a fairly familiar scenario. 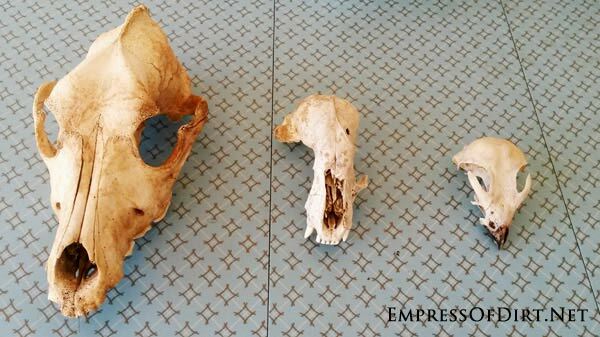 Unlike humans, animal remains are often left to decompose in the open or—as is often the case with our beloved deceased pets—buried shallowly near the surface. Both of these cases mean that their remains may be easily uncovered by an unsuspecting gardener. But what do you do when this happens? This post will help you determine the best course of action for dealing with bones found in your garden. The first (and hopefully most obvious) question to ask is: Could the bones be human? This seems like a relatively straightforward question, but can actually be pretty complicated to answer. If you’re looking at a full skeleton, you may be able to tell just by looking at it. However, individual bones or fragments of bones are much trickier to identify. 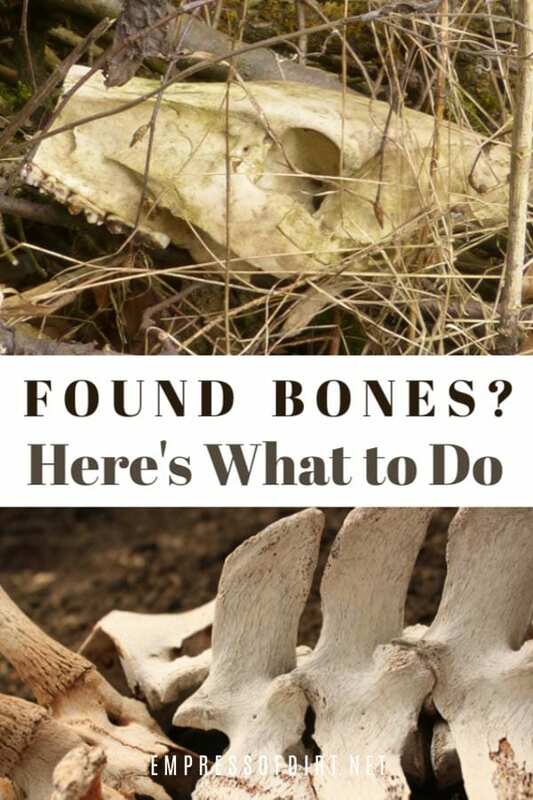 As a rule, if you’re not absolutely sure, it is safest to assume that the bones could be human and call your local police department to send someone to check it out. Much better to be safe than sorry! Once you—or the authorities—have determined that the bones are not human, you may then want to try to figure out what type of animal it is. The internet is a great resource for this—many areas have forums set up for local people to post pictures of animal skeletons they find to have them identified. The easiest way is usually by looking at the size and weight. Are the bones big or small? Do they feel heavy or light? The range of sizes of possible suspects will vary depending on where you live, but in general very small skeletons will be more likely to belong to a bird or rodent, while larger ones are probably a mammal. Bird skeletons are by far the lightest and may feel very brittle. Carnivores will have much sharper, pointier teeth. Herbivores have flatter chewing surfaces on their teeth. Rodents have long incisors (front teeth) for gnawing. 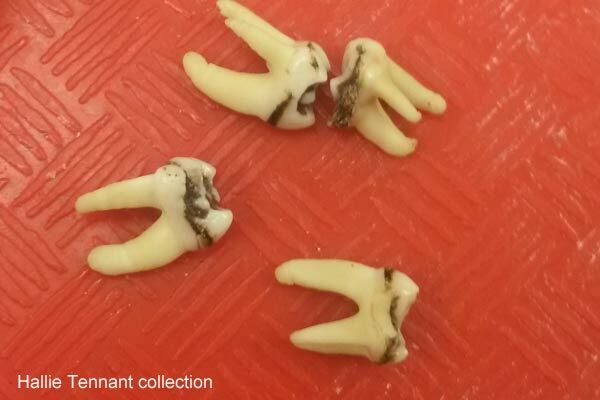 Can you guess what type of animal these teeth came from? These ones are from a groundhog. Groundhogs are omnivores although the bulk of their diet is herbivorous. Depending on where you live, the deaths of certain types of animals may need to be reported to your state or provincial government. This is especially true if you find several dead animals of the same species in one area as this can be indicative of disease. Here are the guidelines for reporting dead animals in Ontario, Canada. Now that you have some idea what type of animal it is, it’s up to you to decide what you want to do with it. Often the easiest thing to do if you find animal bones in your garden is simply to rebury them where you found them, or to relocate them to a more convenient place in your garden. When doing so, use a shovel and gloves and avoid touching the remains with bare hands (especially if they have any fur or fluids left!). We recommend burying them at least a foot below the surface and placing a marker of some sort over top to help you avoid running into them again later. The second option is to discard the bones. Usually this can be done along with your regular household garbage, but you may want to contact your local municipality to make sure. Again, always wear gloves when handling carcasses of any kind and wash your hands thoroughly afterward! The third option (and the most fun, if you’re a nature nerd like us!) is to keep the bones as part of a collection of natural treasures. When prepared properly, bones can be safely handled and stored both as a decoration and also as a teaching tool. One thing to keep in mind is that most places have laws dictating what type of animals you’re allowed to keep and what you’re allowed to do with them. For example, here are the guidelines for keeping a dead wild animal in Ontario, Canada. In most places, you’re okay to keep a skeleton for personal use as long as it’s not a member of a protected species, and you’re not planning to sell it. 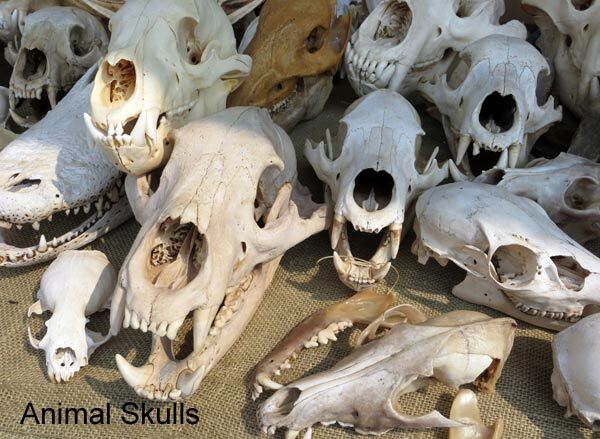 See this tutorial for How to clean animal bones for display. There are several different ways to clean a skeleton depending on how much of the soft tissue is left. We like this guide for basic info. Unless you have a fair bit of experience dealing with animal remains, we only recommend keeping skeletons that are already mostly clean. If you find bones that have soft tissue left on them (e.g. cartilage around the joints, or fur), the easiest thing to do is rebury them in a well-marked spot to let nature do its thing, then dig them back up again in a few months when they’ve had more time to decay. If the bones are fairly clean, meaning they have either been buried for a long time or were left on the surface, they can be gently washed with dish soap in warm water to remove any dirt. If they feel greasy to the touch (think chicken bones), you can also simmer them in a pot full of water at a low temperature for an hour or two. Do not boil! Finally, before displaying animal bones, we recommend lightening them first. This not only helps to further remove any remaining grease, but also gives them a smoother, whiter appearance. 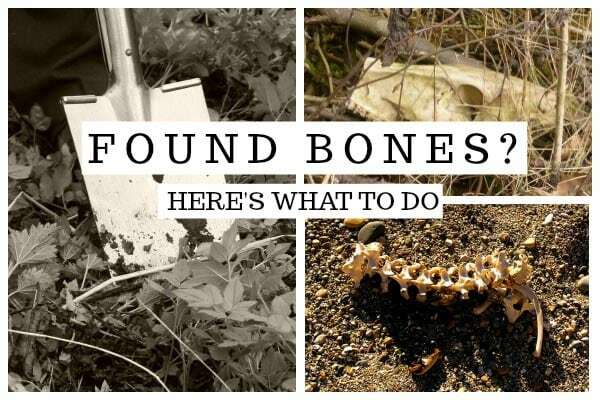 Now that you’ve read our guide, we hope that you’ll feel more comfortable and confident when dealing with found animal bones. Hallie Tennant is a biological anthropologist and visual artist from Waterloo, ON. 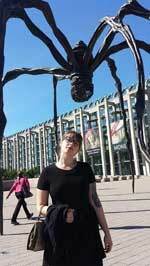 She has a BA in Biological Anthropology from the University of New Brunswick and an MA in Bioarchaeology from Western University (London, ON), where she specialized in Egyptian mummy studies. When she’s not playing with dead things, Hallie likes to read, make art, do yoga, and eat peanut butter. She currently lives in Ottawa, ON with her partner in crime and two cats. PS: Don’t tell Hallie but there seems to be a giant spider nearby! Images provided by Hallie Tennant and include items from her bone collection. Interesting. I have found bones I ended up id’ing as Deer in my forest-bordered garden. Also bones that turned out to be various food- scraps that has been dragged across the yard, from chicken to ribs., by opossum, skunk, racoon, or even birds that pick through garbage near us. Harmless, but is much easier to chase down and pick up chips bags or yogurt containers that have been taken, they don’t blend into the landscape! Very interesting read. If I ever find any bones I will have to think back to this. My son was 8 when he found a small (just fit in his hand) skull while fishing with his grandfather. We tried books, local hunters, etc with no luck in identifying it. Then his dad took him to Chicago’s Museum of Natural History where a guard called a staff member to come out. From 10 feet away, the staffer questioned “Where did you find a baby muskrat skull?” Always go to the experts.